Do you work in an open office? Do you like it? If you’re like most of the people joining this conversation online, the answer is a resounding NO. Despite the fact that over 70% of employees in the US work in an open office environment, there seem to be many more critics than fans. People complain that it’s too loud, too distracting and too exposed. It’s no wonder 74% of employees are more concerned about privacy today than they were 10 years ago. But does this mean open office planning is bad? Do we need to go back to private offices for everyone? We think the answer to these questions is also a resounding NO. Our research shows that the real challenge for today’s open plan offices comes when workers don’t have the freedom to move, and spaces to move to, when they need privacy. The angst expressed by the web community is rooted in the psychological distress caused by a loss of control over what others can see and hear about us and over the various stimuli coming at us all day. This could be as simple as working in an area where no one knows you so you won’t be interrupted. Does your organization allow people to choose alternative locations besides their assigned work area? Consider the lost opportunities for connection when mobile workers no longer have curated displays at their workstations. To give workers more control, enable them to select what others see. Are your mobile workers encouraged to personalize their chosen work setting as they move around the office? Can they choose a telephone call over a videoconference? Do you have a place where you can be with one or two other people and have a private conversation? People need places where they can talk without being overheard, whether it’s a performance review or discussing a personal matter with a friend at work. 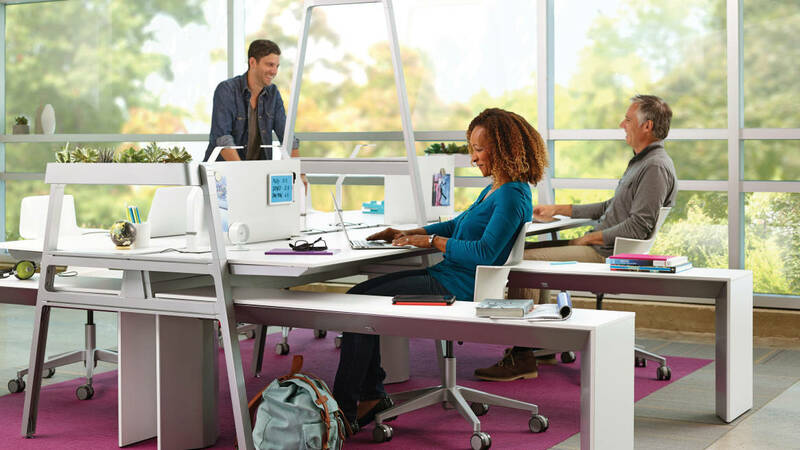 Workplaces can offer screens or configure furniture in a way that discourages disruptions. We often see people choosing seats where they can have their back toward the wall, which creates a sense of psychological safety, by preventing others from approaching them from behind. Sometimes everyone needs a place to just get away. Whether it’s taking time alone to think about a project or rejuvenate by yourself with a cup of coffee, it’s important that people have the means to physically separate themselves from others, for deep focus and rejuvenation. Even the most extroverted people need some time to be alone, even if it’s simply to switch mental gears from one topic to another. Open offices can easily support these five privacy strategies without a major overhaul. The first step is for organizations to recognize that people need a balance between being alone and being with others. Giving people the kinds of spaces that give them control over their information and stimulation can help them feel that the office is actually the best place to get things done. To learn more about the five privacy strategies and Steelcase’s global privacy research check out 360 Magazine: The Privacy Crisis today and let us know which privacy strategy you use the most! Melanie has first-hand experience with international cultures, having completed in-depth human-centered studies in China and North America. She was a principal researcher in several recent Steelcase research quests, including investigations into the post-1980s generation in China, the impact of culture on workplaces in 11 countries, and collaboration among distributed teams.